The sheep does it. The pensioneers move to Spain to do it. My doctor recommends it. Even St Paul the apostle recommends it. "Stop drinking only water, and use a little wine because of your stomach and your frequent illnesses." (1 Timothy 5,23). God knows why wine would be good for stomaches. Unless it is some supernatural thing. You know, like faith healing and such. For some obscure reason, people seems to feel strongly about alcohol. Either they love it, or they hate it. Or fear it, I guess. Particularly those who have lost loved ones either to the alcohol directly, or having them run over by a drunk driver or some such. But generally, people don't just ignore it. Of course, there is always the odd one, such as me. For some years, I've heard how red wine was supposed to be healthy and particularly for the heart. The proof would be that the French did not have particularly much heart diseases, and they have particularly much liver diseases from daily drinking. So the wine must be protecting the hearts. People searched for the active substance in dark grapes, so people could get it without the wine. Then a couple years ago there were two EU studies showing the same effect for beer. If you drink one glass a day (the glasses for beer are obviously quite a bit larger) or perhaps two if you are male, you are more likely to avoid heart infarct and be healthy overall. As you increase the dose, though, it soon turns worse than nothing. It could be a secondary connection, of course. It could be that this drinking pattern corresponds with a certain socio-economic class which has health benefits for other reasons, such as a stable economy and a meaningful job. While over-drinking or no drinking at all corresponds with the lower classes, who are known to be either too fat or too skinny, stressed and uneducated, and likely to die young. But just to be sure, I decided to take up drinking. I lucked out to have great consultants in my best friend's family. Particularly on her father's side they appreciate alcohol, and I got to taste and test several very different beverages, almost all of which tasted python. My friend did bring some pretty strong stuff in from abroad, but I remained unimpressed. I've found a few that were drinkable, though. So I bought home this stuff. A year or two ago. Problem is, I forget to take it. By now it is probably pretty pure vinegar, which may or may not be healthy in its own right. But what a tragic fate for the finest grapes of Alto Douro, wherever that may be. One thing is to be loved or hated, but to languish in a cupboard, ignored, even forgotten? 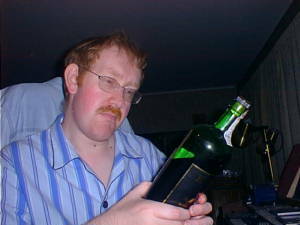 I must say that I am entirely unimpressed by the brain-altering properties of alcohol. It is supposed to induce a pleasant feeling of warmth and relaxation, then euphoria and friendliness, loss of inhibitions and eventually ease sleep. Well, it doesn't seem to work too well on mutants. Another good idea gone vinegar. Sunny day. Did not forget the trash this time.